The tasks that a healthy nose carries out are many. The nose allows us to smell and taste. It conditions the air we breathe and also works as a defence against germs. Above all, though, it guarantees the supply of oxygen to every single cell in our body. It becomes immediately obvious: If the nose has a problem, the whole body has one. Unfortunately, we often ignore our noses until we fall ill, e.g. develop a red, swollen or runny nose. Maintaining the health of the nose should therefore start beforehand. Caring for and hydrating the nasal mucosa ensures that the nose can fulfil its tasks, hence protect your body against colds. The nose is often the first target for viral attacks. Cold viruses reach the nasal mucosa via the air we breathe. The invaders immediately begin to penetrate the mucous membrane cells in order to proliferate there. A healthy mucosa knows how to defend itself against this kind of attack. By producing mucus and sneezing it tries to get rid of the troublemakers. The active substance of Hysan® Adults and Paediatric sprays, xylometazoline, provides a fast and reliable decongestion of the nasal mucosa. It enables free breathing after a few minutes. The active ingredient xylometazoline in Hysan® Adults (for adults and school children) and Hysan® Paediatrics (for children aged 2 to 6) ensures a quick and efficient reduction of the nasal mucosa swelling. It enables free breathing after a few minutes and sufficient space is provided for the viscous mucus to drain. This prevents bacterial infections, and will reduce the need of antibiotic treatment. The nasal mucous membrane is stressed during and immediately after a cold. It shows significant damage because the protective layer of moisture and mucus is impaired. The skin inside the nose becomes friable, sore and cracked. This makes things easy for viruses and bacteria. A fast wound healing therefore reduces the risk of reinfection. Besides the moisturising properties of Hyaluronic Acid, Hysan® Care Nasal Spray contains Dexpanthenol, which promotes the regeneration of the nasal mucosa. This combination creates outstanding conditions for the recovery of the stressed nasal mucosa by rapidly re-establishing the natural protective barrier. Once inhaled cold viruses have managed to penetrate the mucous membrane cells it is too late for preventative measures. The virally induced inflammatory reaction causes a swelling of the nasal mucosa and obstructs free breathing. The mucus transport is no longer optimal. The viscosity of the mucus increases, therefore forming a good breeding ground for bacteria. This situation calls for good air ventilation. 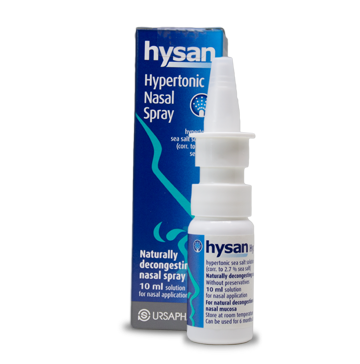 Hysan® Hypertonic Nasal Spray (2.7%), immediately moisturises the nasal mucosa, Due to its high salt concentration, excess fluid from the mucosal tissue is liquefied and withdrawn. Decongestion of the mucosa subsequently facilitates nasal breathing. 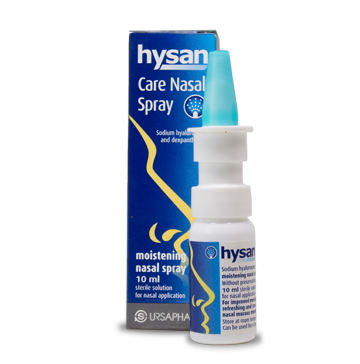 Hysan® Adults 1 mg/ml nasal spray, solution. Active ingredient: Xylo¬meta¬zolin ¬hy¬dro¬chlorid. Therapeutic indications: short term treatment to reduce the swelling (congestion) of the nasal mucosa. For risks and side effects please read the package insert or ask your doctor or pharmacist. January 2018 URSAPHARM Arzneimittel GmbH, Industriestraße 35, 66129 Saarbrücken, Germany. 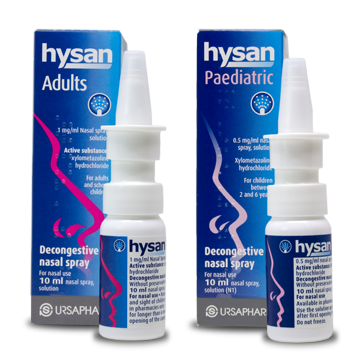 Hysan® Pediatrics 0,5 mg/ml nasal spray, solution. Active ingredient: Xylo¬meta¬zolin ¬hy¬dro¬chlorid. Therapeutic indications: Reduces the swelling of the nasal mucosa caused by rhinitis, a runny nose (rhinitis vasomotorica) or an allergic rhinitis. Facilitates the clearing of secretion during a sinus infection or a rhinitis induced catarrh of the middle ear. For risks and side effects please read the package insert or ask your doctor or pharmacist. January 2018 URSAPHARM Arzneimittel GmbH, Industriestraße 35, 66129 Saarbrücken, Germany. 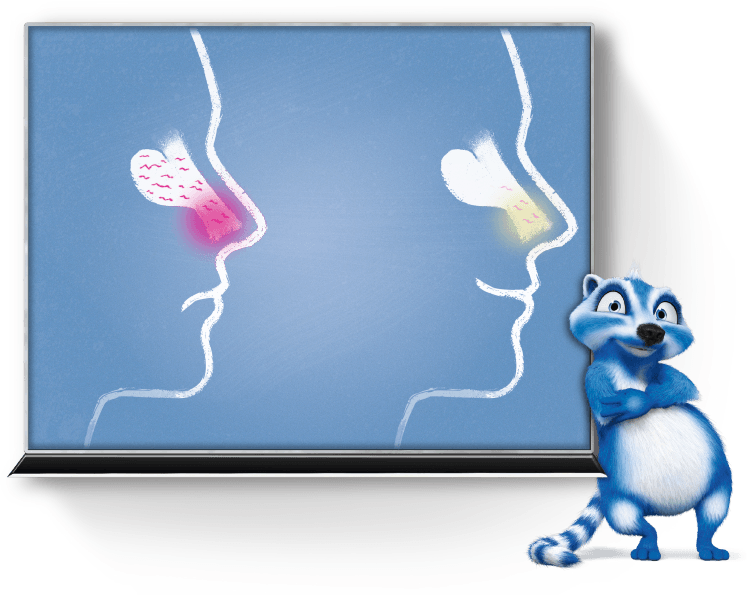 Do you use nasal steroids? Suffering from a dry nose? You'll receive our FREE guide shortly by email.